Ducati Hypermotard 939 updated | IAMABIKER - Everything Motorcycle! With its new Star White Silk colour scheme, the Ducati Hypermotard 939 range is already looking ahead to 2018. Stylish satin white, matched with the red frame and wheels, now enhances the design and style of this unmistakable bike even further. The new livery, in fact, gives a taste of the Model Year 2018 which, nevertheless, still offers the more “classic” Ducati Red with red frame and black wheels. 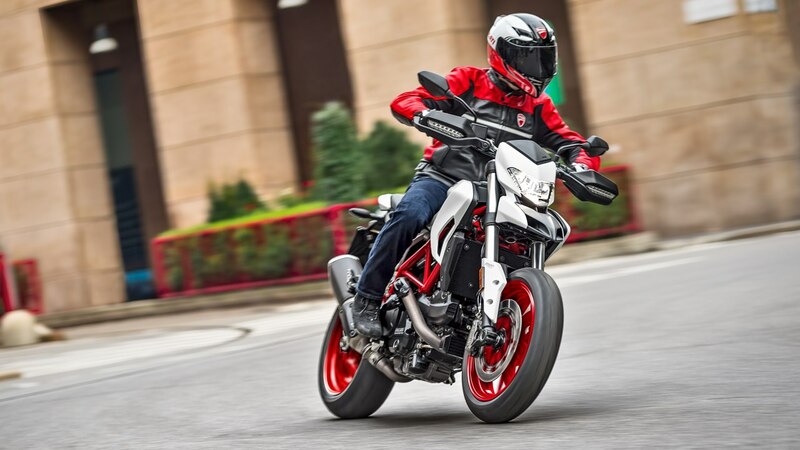 The Hypermotard range, which comprises the super-sporty Hypermotard 939 SP, mounts a 937 cc Ducati Testastretta 11° engine (EURO 4 compliant) that guarantees a maximum power of 110 HP and a torque of 95 Nm. Installed as standard on all versions, the Ducati Safety Pack features 3-level ABS, 8-level Ducati Traction Control and 3 Riding Modes. Each Riding Mode has different electronic settings, giving the Hypermotard three distinct “personalities”. On the suspension front, the Hypermotard 939 mounts a Kayaba upside-down 43 mm fork with 170 mm of travel and a Sachs shock with adjustable damping that gives 150 mm of wheel travel. With a dry weight of 181 kg, the Hypermotard 939 has an above-ground seat height of 850 mm and mounts Pirelli Diablo Rosso II tyres. The most extreme, sportiest version in the range is the Hypermotard 939 SP, which has a slightly lower dry weight of 178 kg. It mounts, as standard, a fully adjustable Öhlins upside-down 50 mm fork with 185 mm of travel. Behind, instead, a fully adjustable Öhlins shock absorber gives 175 mm of rear wheel travel. The SP also features a raised chassis set-up, allowing lean angles of 47.5° – a must-have for on-the-edge track riding. SP specifications bring the above-ground seat height to 890 mm. The Hypermotard 939 SP mounts Pirelli Diablo Supercorsa SP tyres.